For the Around Town Challenge at PaperCrafter's Corner for (Inter)National Scrapbooking Day, I made a page about Litchfield Fair. 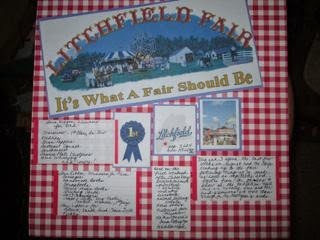 This agricultural fair takes place every September less than a mile up the road from where I live in Litchfield, Maine. The Fairgrounds is often the site for anything big that happens in town in the summer or early fall--the fair, two bluegrass festivals, a country music festival. top left: Blue Ribbon Winners for Dad: Scarecrow--1st place, Sr. Div. (he was 90 last fall); Dahlias; Green Peppers; Butternut Squash; Birdhouses; License Plate Dustpans; Bird Whirlygig and more! far right: Dad and I spend the last few weeks in August and the days leading up to the fair gathering things we've made as well as vegetables and flowers from the gardens to show in the Exhibition Hall. There are no entry fees and the paid premiums are more than enough for the next year's seeds. center, on the map: Litchfield pop. 3,624; area 39.66 sq. mi.